Fighting for Unity! 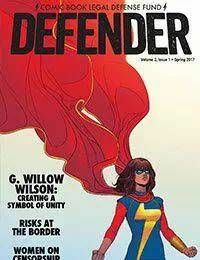 G. Willow Wilson talks about how Ms. Marvel became an icon of activism and inclusion in the battle against intolerance. Celebrate Womens History Month with the ladies who fought censorship! Plus, frontline insight from the trenches of 2017s censorship battles. Every issue of CBLDF Defender supports your right to read and sell comics!